Historical fiction with a paranormal twist. There aren't enough books out there combining historical fiction and paranormal. You have Libba Bray's Great and Terrible Beauty series and Michelle Zink's Prophecy of the Sisters series, but not much else. The Vespertine is a good addition to this cross-genre of books. Amelia travels down to Baltimore from her rural Maine town to stay with her wealthy cousins and meet "the right kind of people." I loved her cousin Zora. She is daring and outgoing, the type of girl who's always out for a good time. Amelia is more straight-laced, but definitely willing to go out on a limb when encouraged. Zora and Amelia egg each other on to get into trouble (although initially not veering out of the bounds of propriety). Amelia discovers that she has visions. It's never accurately explained, but essentially she blacks out and comes up with prophecies about events that will happen to certain people. Some are fun and happy while others foretell doom. Amelia and Zora take full advantage of Amelia's little parlor trick. It opens the door to high society that they never could have entered otherwise. It's all fun and games until Amelia's darker prophecies start coming true. Then Amelia begins to understand the burden of her gift. In the meantime, Amelia falls for Nathaniel, a "fourteenth," a poor artist hired to attend dinner parties so there won't be thirteen people at a table. They are instantly attracted to one another, and Amelia soon steps far outside the bounds of proper Victorian behavior to be with him. It also turns out that Nathaniel has a supernatural power of his own. I enjoyed The Vespertine, but I had some issues with it. On the plus side, I really liked the writing. It's hard to do historical voices correctly. You don't want to be too modern, but you also don't want to be so old-fashioned that the book is unintelligible. Mitchell did a good job balancing these aspects. The old-style writing set the atmospherics of late-Victorian-era Baltimore without dragging the book down. I loved the idea of visions. It fits in perfectly with the love for the occult that was so popular during that time period. On the down side, the book was very confusing as it started out. I also thought the paranormal element was never adequately explained. I prefer paranormal books where the reader is let in on the secret behind the fantasy world. In this case, we knew that Amelia had visions, but don't know why or how it fits into the greater universe. Nathaniel also has a supernatural power. His ability is completely different than Amelia's. I thought his ability was never explained, and I didn't see a reason for it other than a plot device. Back to the bright side: I loved the ending. 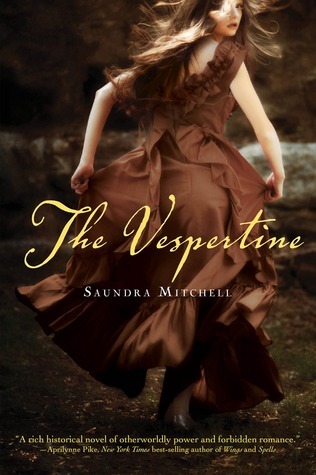 The Vespertine is an enjoyable, if flawed, historical fiction/paranormal novel. I love the premise of this book, but I've heard mixed reviews. I agree with you though.. there aren't enough paranormal historical books out there. Thanks for the honest review! I have this on my netgalley too. Is this a standalone or is meant to be a series? Great review. Yeah - not for me I think. Although it sounded pretty good the reviews have been average. Great review! I like the historical part of it. Super fun. I have seen mixed reviews on this one as well. I like the premise of the book, but don't know if I will like the execution. Thanks for the honest review!! I do still want to read this one, I just love historicals! Yes, thanks for your honest review! I've heard raves about this book from other bloggers so I'm so I'm happy to hear another side. I actually started to read this book the other day. I was extremely confused. I set it down and thought I would try it later. It's nice to know I'm not the only one who was confused about the visions and paranormal aspect of it. LOL I do love historicals and like that the book for the most part was good. Fab review! I have this one in my netgalley queue and look forward to reading it. Does the book stand alone or do you think the paranormal element isn't explained because it is saved for a possible sequel? Just curious, because it seems nowadays that YA books in this genre tend to almost always be series books. Great review! Thanks for stopping by The Wormhole! Have a great week. Happy reading! The popularity of the growing cross-genre crazy is pretty interesting. I think it is going to result in a lot of hits or misses. I don't read a lot of historical fiction, and the supernatural elements of this one makes me curious to give it a try, but it does sound like a key factor is missing if the supernatural abilities aren't fully explained. hmmm... will have to think on this one. Thanks for the insightful review Alison. I like historical fantasies, especially teen ones. Have you read Melissa Doyle's Bewitching Season? Or Sherwood Smith's Crown Duel. I haven't been seeing many good reviews of The Vespertine, which is disappointing because you're right--there aren't many. Very nice and balanced review. I agree on all counts. She really achieved the perfect voice in writing this book. I do wish she had explained more about the paranormal aspects though. I want to know how they work in this world. I was also very confused about Nathaniel's abilities. Thanks for the review. I was going to pick this up but I had when premise/world building stuff is not explained. Maybe I should give this one another try. I tried to read it off Netgalley, but I just could NOT get into it. Historical fiction with a paranormal twist is a great way to sell a book to me because I'm not big on just histfic alone. It's a bummer that some of the paranormal elements of the story lacked explanation but other than that, I can see myself really enjoying this one. Thanks! Hi, this looks like a good book! And a brilliant review! Thanks for hoppin' by my blog! Mixes of qualities are often the best! I felt the same about this book! I loved the writing, but the paranormal element wasn't fleshed out enough for me. I also loved Zora, she's amazing, hope we get to see more of her in the next book!